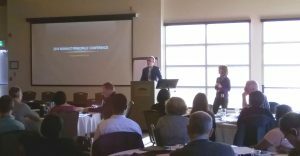 Lynne McCurdy and Barb Holmes presented at the Principals’ Conference in Iqaluit which was attended by John McDonald, Assistant Deputy Minister of Education. The presentation about Bheny and hearing loss in children was well received and during a lengthy question period that followed, many commented on the need for better identification and management of children with hearing loss. Participants were extremely supportive of installing soundfield systems in schools.